Sauna was first introduced to Americans by Finns in the early 1600s. Since then, it has been a part of their lifestyles. With the growing number of sauna heaters, you might find it difficult to find the best sauna heater for your sauna room. Read through our reviews to know more. Most saunas today use this type of heater. An electric stove is used to heat the stones. This stove comes with a timer and a thermostat to regulate the temperature of the stones. This type of heater is ideal for an outdoor sauna. It can be also used in an indoor sauna, which has an exterior wall vent. This is the oldest type of heater. Many people are still using this today to get a feel of the traditional sauna experience. This is a good choice for a barrel sauna. This is the newest technology in sauna heating. An infrared sauna heaters makes use of ceramic or carbon heaters. The infrared sauna is not considered by sauna enthusiasts as real ‘sauna’. They prefer to call it a ‘therapeutic room’ than a sauna since it does not produce ‘loyly’ or steam. This type of heater is commonly used by athletes to help relax their muscles. The first thing to consider before buying a sauna heater is your residence. If you live in the country where there are plenty of woods, a wood-fired sauna heater may be the best option you have. This will cost you less in the long run. 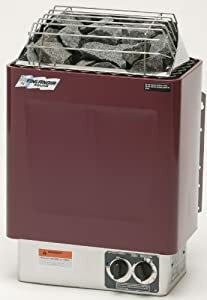 If you live in an urban area, it is wiser to have either a gas or electric-driven heater. Unlike wood-fired heaters, these heaters do not create ashes. A gas heater might also be a better choice if your house has a gas heating system or a low supply of electricity. 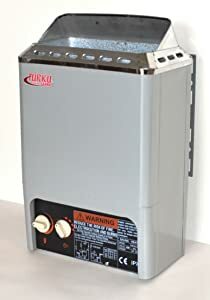 An electric sauna heater’s outer shell may either be made of stainless steel or pre-painted steel. Stainless steel as an outer shell is better at preventing rust formation and lifting off substrate as compared to pre-painted steel. This heater may either be floor-mounted or wall-mounted. In a residential setting, a wall-mounted heater is ideal to be used since it occupies lesser floor area. Floor-mounted heaters are mostly used in commercial saunas since these are larger in size, they can accommodate heavier rocks. The size of your heater must match the size of your sauna. A small heater might be a better cost-effective option if you have a small sauna room. Choose electric heaters that have US or CSLA certifications for safety reasons. This heater does not have CSLA or US certifications, so it might not be approved for use in your home. Plus, it might not be covered by your insurance. Some wood-fired heaters come with a porcelain finish. This might be a good choice if you want a durable and tougher outside finishing. This type of heater does not warm up the surrounding air. It can only heat up the surface it is pointing to. Some of the benefits of sauna include the following. It helps reduce muscle soreness and joint pains. It relaxes the mind and body. It increases the body’s resistance to illness. It relieves allergies and sinus congestion. 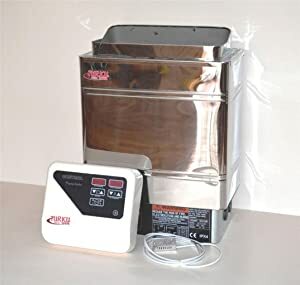 For more on weight loss and other associated issues, please have a look at ‘Get rid of stubborn weight with this simple tool’, ‘Reliable Sauna Suit Reviews for Amazing Weight Loss’ and “The best portable sauna information you will find“. We look at the benefits of each and give our opinion on a few of the best available products on the market. Harvia Manufacturing of Finland made this electric sauna heater, which can heat up 300 cubic feet (L x W x H) 7’ standard sauna room. is ETL certified, which means that it has passed the US OSHA’s safety standards. Another good thing to like about Finlandia FLB-60 Sauna Heater is that it comes with large rocks. So, you won’t have to bother looking for some. This compact mini electric sauna heater from Turku is CE and ISO certified. It is an excellent choice for those who prefer an 110V or 120V unit and to those who have small sauna room. This heater is ideal for use in a 45 to 90 cubic feet sauna room. We like this product’s versatility because it can be either used for a wet or dry sauna. This product has a built-in controller, which is great because it is much easier to wire it that way. This electric heater comes with a stainless steel modern design, which makes it a durable product. It can be used for wet and dry sauna, but not with infrared saunas though. Other good features of this product include its aluminum thermostat sensor casing and high grade Teflon coating elements. We also like this product’s digital controller, which does not produce any ticking sound. Unlike other heaters, this heater can be pre-set up to 12 hours. This product is CE and ISO certified. 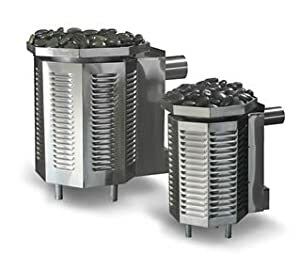 This heater features a 100% stainless-steel body, which prevents corrosion or rust formation that can be caused by exposure to elevated temperatures and moisture. This product comes with an extra large tray, which can hold 160 pounds of rocks and eight gallons of water. This capacity turns your sauna into a steam sauna in a short span of time. We also like it’s built-in thermal cutout, which protects this heater from overheating. Another good thing about this product is that its sealed combustion heaters do not need flue or gas connections inside the sauna. This wood burning sauna heater is a product of Harvia of Finland, and is a great choice if you have a small sauna room. A unique feature of this product is its dual function. This can be used as a fireplace and as a wood burning sauna stove. 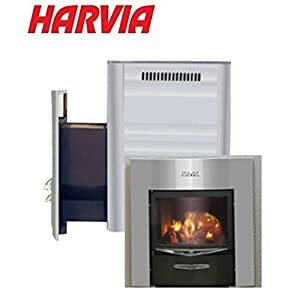 We also liked that this heater comes with 2 boxes of genuine Harvia sauna stones. This means that you can start using it once you received it. Another good feature is its stainless steel outer casing, which adds up to this product’s durability. This product can work well with accessories like chimney kit, chimney pipe, chimney pipe extension, and water heater. All of the products we have reviewed have quality features, but based on our standards we pick Finlandia FLB-60 Sauna Heater as the best sauna heater. This heater is durable for its stainless-steel casing. This is also the only product with ETL certification, which means it has passed the standards of US-OSHA. We also liked that this heater comes with the sauna stones.